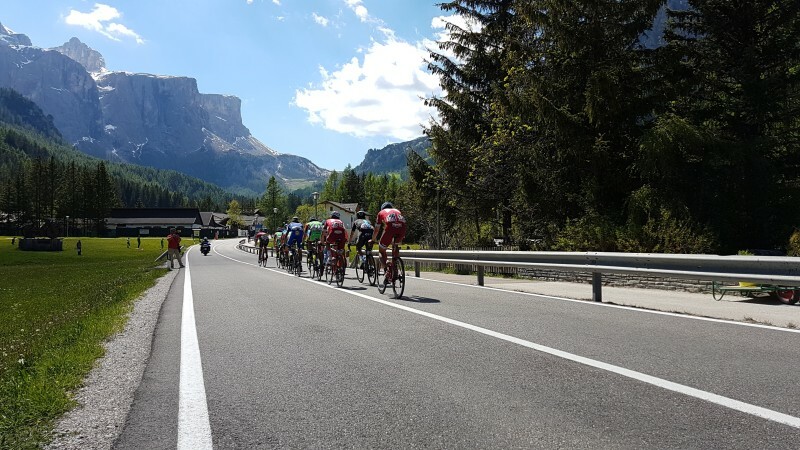 As road cycling day tours go, the Sellaronda is pretty famous; and for good reason as it passes through some of the finest mountain scenery in the world, climbing some of the most coveted passes. 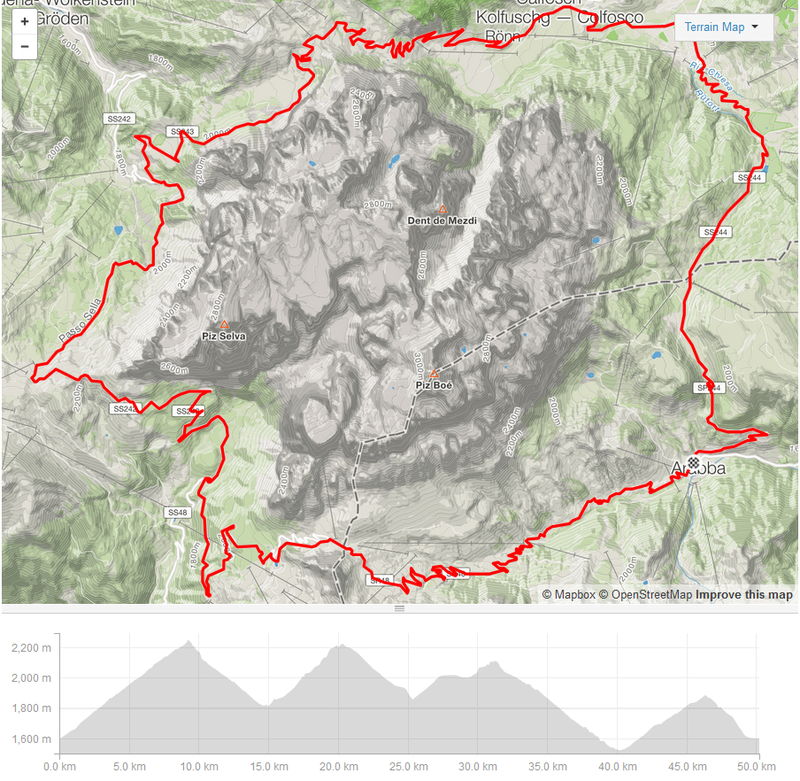 And it’s achievable by cyclists with a modest amount of fitness; 1845m of climbing along just over 50km of high mountain roads reaching just shy of 2300m ASL. Encircling the Sella massif, it visits Arabba, Passo Pordoi, Passo Sella, Val Gardena and Passo Gardena, Alta Badia and Passo Campolongo. I’ll split the clockwise route into 4 segments and make some suggestions on how best to approach the ride. There is plenty of parking in and around Arabba. It’s an ideal spot to start as this small town best known for it’s skiing hosts a large number of restaurants, cafes, and shops – including a bike shop where you can pick up gas canisters and inner tubes should you need them. There is also a waterfountain near the church where you can top up bideons. The climb towards Passo Pordoi is quite long, 9.2km with an average gradient of 7% with few flat sections and 33 hairpin bends. This said, nowhere is it particularly steep, this being reflected by the max gradient of 9%. Although reasonably enclosed, the views are splendid with at first Piz Boe and then Piz Pordoi coming into view. You pass a WW1 Monument high on your right as you approach the pass where you will find some hotels and the base station of the Piz Pordoi cable car lift. The trip to the summit of the Pordoi is well worth the 14 euro ticket if you have time spare or come back another day. 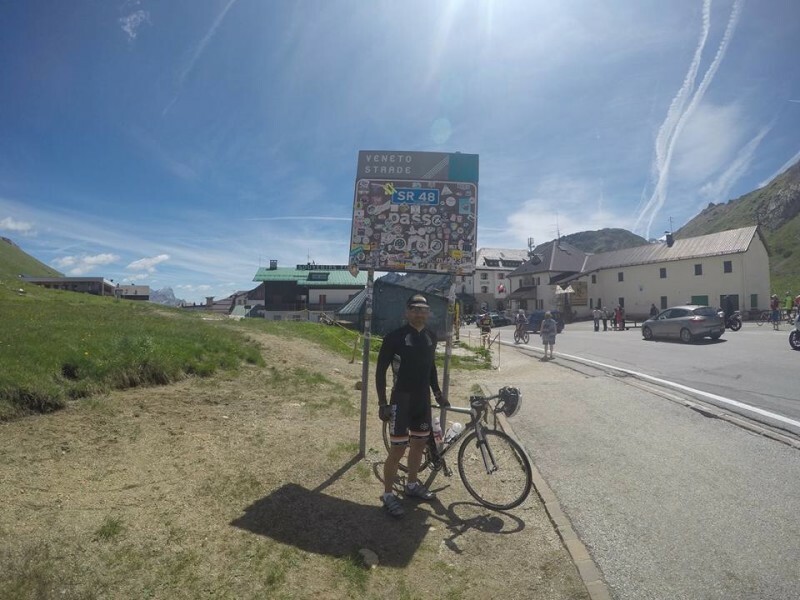 One of our guests reaches Passo Pordoi. Long hairpin bends take you down the Val di Fassa side of the pass towards a junction known as Bivio Sella. This route can be quite busy with tour bus’ which sometimes due to their length get a bit stuck around bends – so make sure you hover over your brakes so that you can anchor on in a hurry if you need to! You never know what is lurking around the next corner. You reach the junction and turn right and after a couple of short bends you reach the flat of Pian Schiavenais from where you get wild views of the 800 metre high NW face of Piz Pordoi and equally impressive Piz Civazes. 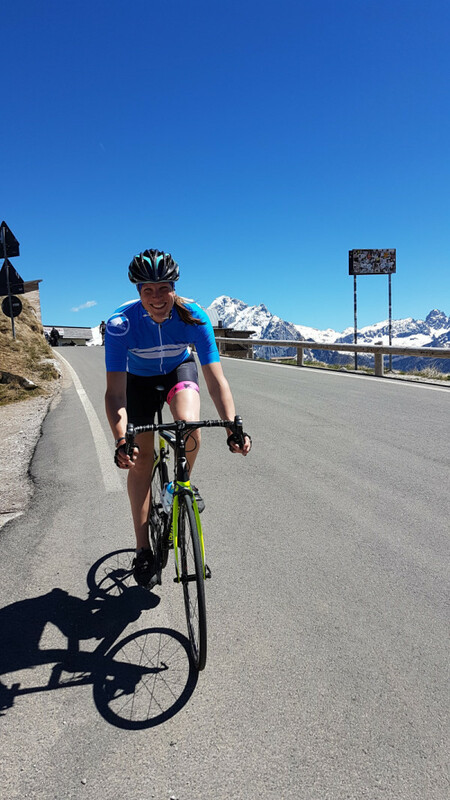 They will be your companions for this climb, which is shorter and sharper than Passo Pordoi, with more respite during the bends, but steeper sections mixed in up to 12%. There however are never long and the views help take your mind off them, especially once you approach the pass and it opens up to Val Gardena when you get one ofthe most awe inspiring 360 panorama’s I’ve seen in any mountains. Now Piz Pordoi is accompanied by Marmolada, Sassolungo, Torre Innerkofler, Sass dei Meisules, the Odle range, the Cantenaccio and many others. It also is a good place to look for food – descending a km down the other side you will find some excellent restaurants and huts, my favourite of which is Malga Sella, a small farm sted hut serving excellent local dishes with a sun terrace to the front. It is down a small dirt track to the left after the larger huts. Sophie, reaching Passo Sella on a fine afternoon with Marmolada in the background. Open views, long straights and few hairpins characterise the fast descent to the next junction. The sweeping views are as ever, breathtaking. In only a few minutes it’s over and you start the third climb to Passo Gardena. It’s less steep and intense but by now you’ll be feeling it a bit. Half way through there is a long flat traverse beneath the ramparts of the Sella massif which allows you to catch your breath before a final push up to the pass. It’s all change as as you leave behind Sassolungo and Alta Badia with it’s striking walls either side of the valley come into view. You’re now faced with the longest descent of the day. Hairpins stretchout before you for as far as the eye can see and it’s a great descent with long straights between corners. Indeed you hardly need to pedal until you get to Corvara when a short flat brings you into this Ski town. You take a right onto the main road through the town and it immediately starts to climb again. This pass is characterised by a steep section to start with, the gradient gradually picking up as you leave the hotels and bars behind, with numerous short corners. At least it eases again, with long straights until you reach your final summit of the day. The descent to Arabba is quick, letting you enjoy a celebratory beer! The Giro d’Italia flies through Corvara on the way to Passo Gardena, May 26th 2017. Bike hire: If you are only visiting for a few days, you will most likely want to hire a bike rather than transporting your own. There are a number of shops who rent road bikes. Ski Service Reba in Arabba have a few road bikes. Unfortunately I can’t find a website. Of course if you plan on bringing your own bike, most airlines will carry bikes at cost. A road bike, as light as you can afford is the name of the game. The roads here abouts are in good condition, many stretches having been recently resurfaced and with quite modest maximum gradients, a double chainset is perfectly adequate. Most people carry two bideons and refill at intervals along the route. You should of course carry a multitool, a spare inner tube and some gas cartridges which you can get at the bike shops mentioned above. Helmets are essential as the roads here are busy, although drivers are usually courteous and give cyclists space. If you have clipless shoes, it’s worth bringing pedals with you just incase they don’t have your cleat style. The best seasons for cyclining in the Dolomites are late May to mid July, and September until mid October, when temperatures are cooler and there are fewer thunderstorms. Temperatures at the passes at the start and end of these seasons can be decidedly chilly at the top of the passes so carrying a windshirt is recommended and possibly knee length bib shorts. But mostly it is warm and dry during these times. One thing to mention is that there are several organised Sellarona Bike Day events every year when th roads are closed for the day to motorised traffic. This sees mass starts with thousands of cyclist completing the route.